Three years ago my husband gave me what I think it the most special gift I’ve ever received. It was our 8th anniversary, and it was a small 5×7 work of art he made for me himself. In that small space he managed to sum up our 8 years together. And he did it perfectly. It goes without saying that nothing, for any amount of money, could have been as special as that little work of art he created. To this day it’s still one of my most treasured possessions. If you’ve ever received a homemade gift then you know the warm feeling of happiness that goes along with it. In today’s consumerist society it doesn’t take a second thought to go out and buy someone something. But to receive a homemade gift…well, that’s something special. Homemade gifts speak of love in its truest form. It’s time taken, creating something with an open heart, and given with the simple joy of giving. If you want to give some special gifts this year, or you’re looking to save money or reduce waste by not shopping, then making homemade Christmas gifts is the way to go. I decided to create a master list of homemade gift instructions. If you’re looking for a great homemade gift to start on, you’re in the right place. And if you’d like to see my article on “Eco-Friendly Holiday Gifts” for more ideas, you can click here. Post Publication Addition: Want to win a holiday gift basket? Then enter to win our Ultimate Holiday Gift Basket. Contest is open until Dec. 15, and the basket is stuffed full of eco-friendly goodies. Great for you, or for gifting! Click here to enter. Good luck! Want to listen to some free Christmas music online while you make your gifts? You’re in luck, because I found some stations that play nothing but holiday music. Christmas Broadband– This station has been streaming holiday music since 1999. Lagniappe Christmas– Want Christmas Southern style? Here’s a station that plays the old standards, New Orleans’ style. North Pole Radio– This site was really easy to listen to. Ok, now that you’re feeling festive and have some tunes going (I have to admit, being from Louisiana, that I’m partial to the swanky Lagniappe Christmas station…) let’s dive into the world of homemade gifts and see what we can come up with. 1. Make A Secret Hollow Book- Ok, this idea is just really neat. 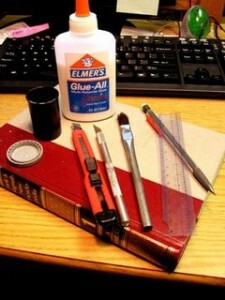 Thanks to How2DoStuff, we can easily make a “book safe” out of an old book, using only basic supplies. The instructions to this great and unique project are crystal clear, and there are plenty of pictures to guide you along the way. If you’d like to go right to the instructions for this project, click here. Sigh. I love Instructables.com. There are so many cool projects there, and I wish I actually had time to do them all! As soon as I saw this one my heart sighed with delight. Yes, it’s a bit weird, and a concrete lightbulb hook would certainly make an out-of-the-box gift for anyone who loves industrial/modern design. But can’t you see a row of these hanging by a back door for purses and coats? How cool! 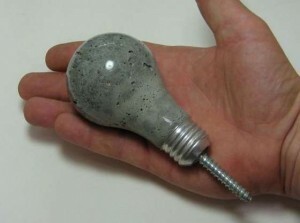 The instructions for this concrete lightbulb hook, on par with the rest of the projects at Instructables.com, are clear and easy to follow. If you try this particular project make sure you read the comments below for some great troubleshooting tips. You can click here to go right to this project. You’ve probably seen these magnets in little boutiques. I love the ones with cut out pictures of old maps, and old pictures of birds. Marble magnets make a funky, functional decoration for your fridge. And, they make a really cool, really inexpensive gifts. 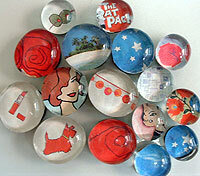 Not Martha (as in, Not Martha Stewart) has a great set of instructions for making these cool magnets. And, you can easily print off photos from your computer and make some really personal magnets. Yes, these are sweet times 10. And if you have plenty of baby food or larger sized jars lying around, this would be a great project to make for the holidays. 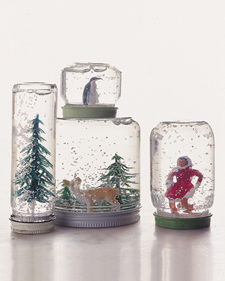 Although the homemade snow globes come to us via the real Martha Stewart, it really isn’t a difficult project to make at all. It’s been around a long time (I remember first seeing it back in 2003, in one of my first apartments!). Martha Stewart also has amazing instructions for making your own homemade snowflake decorations. I’ve made these before and they come out amazing; definitely worth the time to do it! I’ve kept mine year after year with careful packing, so you don’t have to recycle them at the end of the holidays if you don’t want to. I love these gifts. LOVE THEM. As someone who battles her own demons with cooking, I love getting mixes where most of the work is done. What’s better than that? Homemade food mixes are great because it’s easy to make a huge batch. And, they’re pretty frugal to put together. If you’d like to make your jar kits really pretty, you can check out this amazing kit by Creatively Green. Creatively Green is an art/craft supply store that only sells eco-friendly supplies. And their jar kit is full of vintage buttons, ribbons, and labels to make your jars really, really cool. Now, the picture on the right is, take a deep breath here, White Chocolate Chunk Brownies. 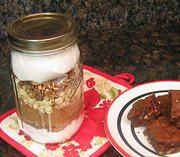 I found this great list on About.com that has tons of gift mixes that work great in jars. What about Mocha Coffee in a jar? Or, homemade Hot Cocoa with Marshmallows? You could also try a Mexican Hot Cocoa. I love Mexican Hot Cocoa because it’s spicy and has a lot more personality than regular hot cocoa (it has chili powder in it, among other things!). If you try this recipe of Mexican hot chocolate just omit the wet ingredients and make a mix of the dry ingredients. Make sure you create a recipe card letting the receiver know what they have to do to finish it off! 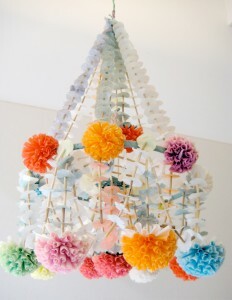 I stumbled onto these luscious Polish paper chandeliers, or pajaki, via Decor8 a few weeks ago. I still haven’t found any instructions online on how to make them, but I’m convinced my library must have something. I’m going to go look soon because I really, reallywant to make one. For those of you who are naturally crafty-inclined you might not even need instructions; you could just look at it and figure it out. Me? I need instructions. If you have ever made one of these, or you know where there are some instructions, could you please leave a comment with a link or a tip? I’m enthralled with the idea of these, and think they would make an amazing gift. But alas, I have no idea how you’d make those cool paper flowers! I love Wordle. Wordle is a free site that allows you to make these really beautiful word clouds out of a list you type in. You can choose your color scheme and orientation to make it look more customized. Well, think how cool it would be if someone typed in 50 reasons why they love you. Or, 25 words that all describe your personality quirks. Then they printed off this cool little work of art, framed it, and gave it to you. I’ve made Wordles for my goals in life, and I find them really inspiring. I think they would make a really touching gift. I started making homemade lavender oil this summer and I have to tell you, I LOVE it. I use it every day instead of traditional lotion, and it’s doing a great job of keeping my skin moist all day. I ended up using olive oil for my base and it has turned out great. It really does smell like lavender, and I only need to use it once per day. There’s a good reason why Spanish and Italian people are so beautiful; they know how amazing olive oil is for your skin! If you’d like to see how to make your own homemade lavender oil, you can check out my post here. Put in a pretty bottle with a cork, this would make a fantastic gift. 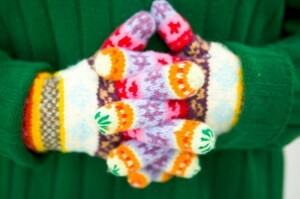 Do you have any homemade holiday gifts you love to give every year? If so I’d love to hear about them and share them with readers, so please send them in! I give alot of my home canning out of my garden, jelly and pickles mainly, usually every year. My family gives me back the jars when they are empty and I reuse them the next canning season. One year when we were young and broke I made everyone shadow boxes from scrap wood from a neighbors remodel. I didn’t know what I was doing and they all looked kind of un professional, but when my husband opened his shadow box, he cried knowing how much time and black and blue fingers I had went through, that was the most special Christmas gift I have ever gave to him, we still have it hanging in our home (although it was very rough and I have had to “fix” it a couple times). He once made me a two headed nail ring from a real nail. I wore it until it wore out my finger. But I still have it. A candleholder made from a piece of wood that my brother worked very hard on (it would be sold for 45$ in any fancy shop), a cooking book made by my mother containing all my family’s favorite recipes (given to me because I’ll soon leave this house to live on my own), a very good looking necklace (it looks even prettier than the ones I bought because it is personalized), a secret hollow book (I took the idea from the greenest dollar:P), recipes in a jar (to which you add later the liquid ingredients, also took the idea from this website). Finally, the nicest one is a jewel holder created with a branch stuck into a piece of wood that had been sandblasted and polished. This way, the brach looks like a tree. My mother also decorated it with colored cords that she rolled over the whole \tree\. The result is totally unique and magnificient, seriously, I am totally sure you will never see one like that, it is priceless. So, that was probably one of the most beautiful Christmas I’ve ever had because of three reasons; 1- We were with people we love, 2- We were proud of what we gave because each gift was specially made for one person in particular and because we’d spent time on it which made them even more valuable, 3- We escaped from the whole stress related to shopping and spending money and fins last-minute gifts that had no sense in particular, this was also priceless!